1. To make the tart shell, whisk together the egg yolk, cream, and vanilla in a small bowl; set aside. Place the flour, sugar, and salt in a food processor and process briefly to combine. Scatter the butter pieces over the flour mixture; process to cut the butter into the flour until the mixture resembles coarse meal, about 15 one-second pulses. With the machine running, add the egg mixture and process until the dough just comes together, about 12 seconds. Turn the dough onto a sheet of plastic wrap and press into a 6-inch disc. Wrap the dough in plastic wrap and refrigerate it for at least one hour or up to 48 hours. 2. Remove the dough from the refrigerator. (If refrigerated for more than an hour, let stand at room temperature until malleable.) Unwrap and roll the dough out on a lightly floured surface to a 13-inch round. Transfer the dough to a 9-inch tart pan. Mold the dough to the sides of the tart pan and remove the excess off the top. Set the dough-lined tart pan on a large plate and freeze for 30 minutes. 3. Meanwhile, adjust an oven rack to the middle position and preheat the oven to 375 degrees. Set the dough-lined tart pan on a baking sheet, press a 12-inch square of foil into the frozen shell and over the edge, and fill with pie weights. Bake for 30 minutes, rotating halfway through the baking time. Remove from the oven and carefully remove the foil and weights. Continue to bake until deep golden brown, 5-8 minutes longer. Transfer the shell to a wire rack to cool completely. 4. Melt the chocolate in the top of a double-boiler over simmering water. Spread the chocolate in a thin, even layer over the bottom of the cooled tart shell, reserving some chocolate for drizzling. Keep the remaining chocolate heated over hot water to use later. Refrigerate the coated tart shell until the chocolate hardens. 5. In the bowl of a stand mixer, cream the sugar and cream cheese until fluffy. Beat in the whipping cream. Spread the cream cheese mixture into the cooled tart shell and chill for one hour. 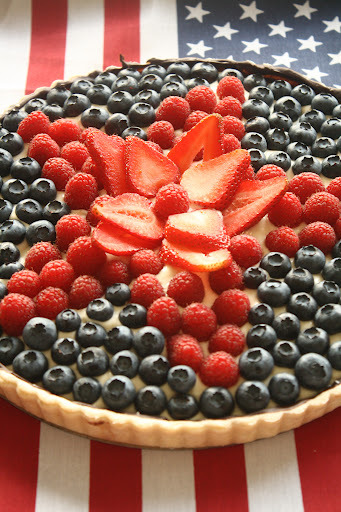 Arrange the berries on top of the filled tart, starting on the outside and working toward the center. Drizzle the reserved chocolate over the top of the berries, if desired. Chill the tart until you are ready to serve. For my family’s Fourth of July get together last week, the dessert spread was a group effort. My sister and I baked a fabulous Ricotta Cheesecake courtesy of David Lebovitz, my cousin contributed a decadent Chocolate Pudding Pie, and my aunt whipped up her famous Berry Cream Cheese Tart. I first tried this dessert at another summer barbecue a couple years back and immediately loved it. The combination of the buttery, tender crust with the rich cream cheese filling and fresh berries is simply irresistible. The dark chocolate shell adds a subtle note of bitterness and ties the whole tart together. In celebration of The Fourth, my aunt opted for a patriotic red, white, and blue star design. However, this dessert would be appropriate for any special occasion throughout the seasons and you can use whichever berries you prefer.